After 2 years of hard work, all partners were happy to present the results of the project, as well as the EWIT Toolkit. 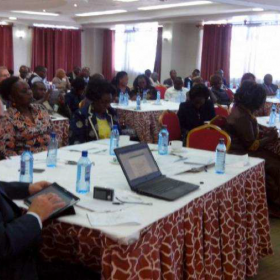 The “Developing an e-waste implementation toolkit to support the recycling and the secondary raw material recovery strategies in metropolitan areas in Africa” project held its Pan-African final conference on January 25th, 2017 in Nairobi, Kenya. EWIT partners from Europe and Africa, as well as members of the Advisory Committee of EWIT and external stakeholders took part in the event. During the conference, a special focus was given to the EWIT cases-studies, and sharing experiences from a Pan-African perspective. The question of involving the wide public to explore the toolkit and disseminate it was also discussed, in addition to setting up the basis for possible follow-ups and long-term Europe-Africa relationships. The E-waste Implementation Toolkit (EWIT) contributes to finding and supporting solutions for effective e-waste management systems in African urban areas, improving the environmental and health conditions, generating new jobs and increasing recycling opportunities for entrepreneurs. 24 partners – both from Europe and from Africa – are part of the Consortium implementing the project.